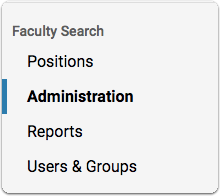 Depending on your institution's or department's settings in Faculty Search, Evaluators can comment on applications from the Applicant Profile page, and can also add comments from the Materials Viewer while reviewing applications in a browser window. Comments are not the same as annotations. Depending on the settings in the program, comments may be visible to other reviewers, where as annotations are personal notes only visible to you. Click on the link to the positions page located in the navigation bar. 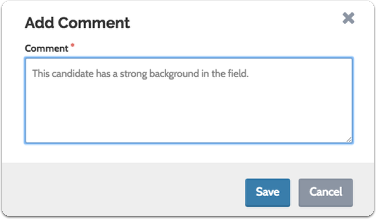 Scroll down to "Comments" and click "Add Comment"
Depending on the settings, you may only be able to read your own comments. Note that you can edit and delete comments using the icons to the right of the page. You can also comment on applications from the viewer by following the steps below. This allows you to load multiple applications into your browser and scroll through leaving comments without leaving your browser window. On the Applications page, select the name or names of the applicants to review and click "Read"
The applications you've selected will open in the viewer. Click next to "Applicant Name" at the top of the table to load all applications into the viewer. Enter your comment and click "Save"